The regulation of gene expression impacts all aspects of cell biology and biochemistry. As we gain a greater understanding of the mechanisms involved in this process, we also begin to unveil its complexities. The delicate balancing act played out by the multitude of DNA interacting proteins can easily become unhinged. The implications of this may potentially lead to cell death or a diseased state. Recent microarray technologies are now allowing scientists to begin the journey into characterizing the relationship between gene expression and DNA modifying proteins. For example, genome-wide studies of protein-DNA interactions, such as Chromatin Immunoprecipitation on arrays (also referred to as ChIP-chip), allow for a global view of where and when DNA binding proteins interact. A number of microarray based genome wide methodologies have emerged based upon these same principles. Here, we outline a methodology that we have developed using the ChIP-chip technique. 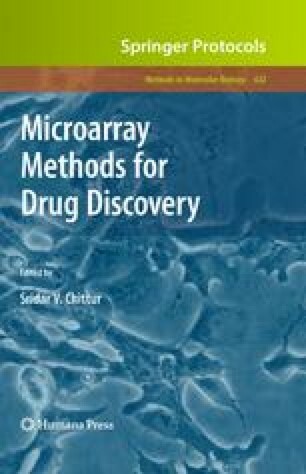 Application of this methodology is easily adaptable to different cell types, antibodies, and to a variety of array platforms.